A career in Airtricity League football is short-lived, demanding and financially unrewarding. While the elite players in the top European leagues are lucratively remunerated and live the high life, the majority of professionals, or semi-professionals in this case, in the League of Ireland have to contend with harsher realities. 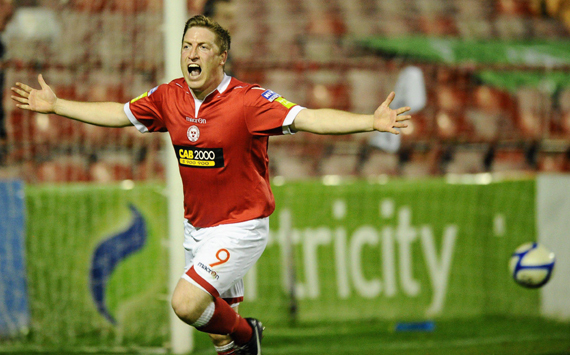 Just ask Conan Byrne and his St Patrick’s Athletic team-mates. Byrne took the Premier Division by storm in 2013; he was the driving force from midfield as the Saints won their first title in 14 years with a couple of games to spare. Nonetheless, now that the curtain has drawn on the campaign, Byrne, like the majority of the league’s players, is out of work. Well-travelled striker Philly Hughes is in the minority having planned for the future. "I’m lucky to have a full-time job with Irish Rail after completing an apprenticeship which eases the burden on my football," he says. The 32-year-old is out of contract since last Friday with little indication whether he’ll find a new employer for next season. "There haven’t been any offers as of yet but hopefully I’ll get a contract for 2014 when clubs start building their squads after Christmas," he says. It wasn’t so long ago that clubs in Ireland were dishing out excessive wages on a weekly basis. Obtaining a competitive advantage on the pitch came at all costs with long-term sustainability disregarded. This pursuit of instant triumph was a short-sighted and reckless strategy which epitomised the Celtic Tiger years. Just five years ago, the average yearly wage of a League of Ireland players was upwards of €40,000 while the top performers were taking home six-figure sums. Attractive pay packets of bygone seasons only served to highlight the absence of a viable business plan. "As a player, I was in situations where you didn’t know on a weekly basis whether you would be paid or not," Ollie Cahill of the Professional Footballers Association of Ireland points out. Clubs prioritise fiscal prudence ahead of any individual salary in order to stay afloat in these austere times. As the country comes to terms with the latest cost-cutting budget, the domestic football scene bears testament to a decade of frenzied spending with the era of lengthy contracts and hefty pay packets for League of Ireland footballers a very distant memory. Put bluntly, proper professional football in Ireland has flatlined. The only "full-time" contracts offered are 40-week ones. It’s a situation which forces players to sign on for social welfare until the New Year, or in other cases, obtain seasonal work. Players who once thrived as potential employers forked out thousands for their signature, have not only seen their weekly pay-slip shrink significantly but now have little option but to top up their incomes between November and March. "There have been drastic changes in how boards manage their finances," Cahill says. "There is more realism over the size and length of contracts now. Clubs are aiming to solidify and establish an astute long-term business which means they can pay players wages on time, every week." Irish clubs have been forced down the road of self-sustainability and prospective planning with sizable sponsorship deals and generous private investment no longer boosting the coffers. For all the prestige of lining out each week in pursuit of glory, the culmination of a long, arduous season for players only brings only apprehension about impending unemployment. "It’s not right that this happens. We would like to see a situation similar to other leagues where players get paid for 52 weeks but it’s just not feasible," Cahill says. "Most players here are now part-time professionals and I can understand why they are only paid for nine months but it has a knock-on effect. There is lots of movement of players, with clubs not looking long-term and as a result, every year most have to sign a full squad all over again." Despite all the ambiguity and negativity surrounding contractual and financial circumstances, the new measures have ensured the league is beginning to demonstrate a largely stable economic model with fewer clubs recording losses come the season end. Byrne, meanwhile, admits he’s one of the lucky few for another year at least. "I have thankfully signed with St Pat’s next season. It just means I can rest easy and enjoy the off-season without the uncertainty others have to endure."